Old Warden Cycle Route at Old WardenCycle RouteThis 23.6 kilometre circular route starts in the picturesque village of Old Warden. You will cycle through some of the most attractive villages in Bedfordshire – Southill, Northill and Ickwell Green. Old Warden is signposted from the A600, about 6 miles south east of Bedford. There is parking at Old Warden Village Hall car park - please park considerately. There is alternative parking at St Leonard's Church. Start from the car park at the Church. 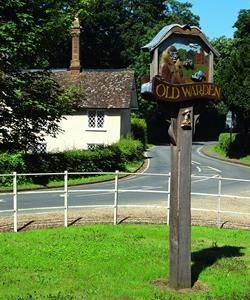 This 23.6 kilometre circular route starts in the picturesque village of Old Warden. You will cycle through some of the most attractive villages in Bedfordshire – Southill, Northill and Ickwell Green.